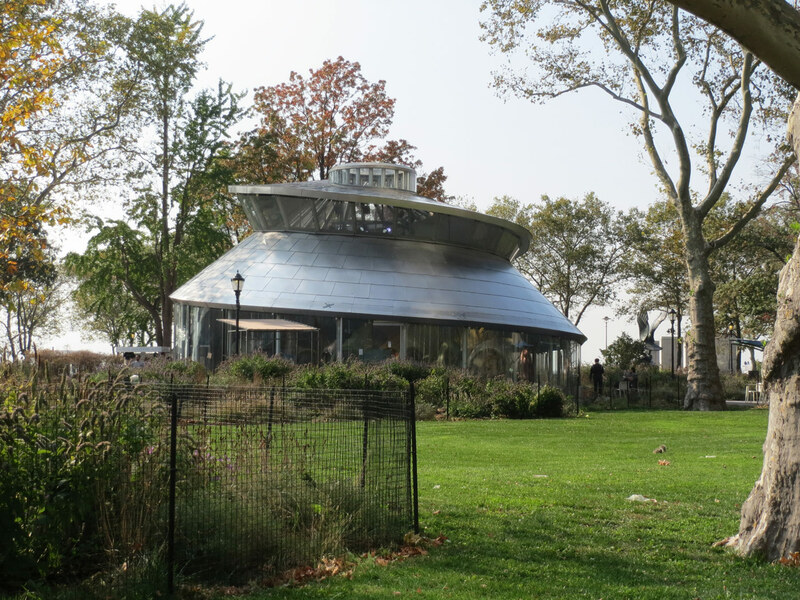 This story is part of a monthlong series of guests posts by AIA New York that feature Archtober Building of the Day tours. See the full 2017 schedule here. For today’s Building of the Day, Archtober took us on a guided architectural tour of the Alexander Hamilton U.S. Custom House, now home to the National Museum of the American Indian (NMAI). Our knowledgeable guide, Jeff Harrington, Museum Ambassador of NMAI, described the building’s history, focusing on the magnificent architecture by Cass Gilbert. We started our tour in the rotunda, the massive central space that anchors the building. Here, Harrington gave us a run-down of the site's history. The lower tip of Manhattan Island, acquired by Dutch settlers in the early-17th Century, was the site of the New Amsterdam settlement. The central point of New Amsterdam was Fort Amsterdam, which stood where the Customs House is now. In 1665, New Amsterdam surrendered to the British, who renamed it New York. In 1790, the federal government demolished Fort Amsterdam (then known as Fort George) to build the Government House, which was intended to be the presidential residence but was never actually occupied by George Washington. Government House later became the Governor’s mansion, and from 1799 to 1815 was New York’s second custom house. In the late 19th and early 20th centuries, customs taxes were the largest source of national income, since income tax and other federal taxes were vastly lower than they are today. Imports to New York Harbor were rapidly mounting, and the Custom House needed a larger home. In 1899, Cass Gilbert won the competition to design the new Custom House. The process was marked by some controversy; his former architectural partner, John Knox Taylor, was the Supervising Architect for the Department of the Treasury and hence on the selection committee. Work began in 1900 and was completed in 1907. As a measure of the Custom House’s importance, the entire land acquisition, design, and construction budget of $9 million was paid for in the first month with Custom income. Gilbert designed an immense, imposing seven-story edifice with 450,000 square feet of floor space. Unlike almost every other custom house, the entrance faced away from the sea – which at that time, before landfill, was immediately adjacent to the site – and up Broadway. Gilbert wanted the first glimpse of the United States to be not the inside of a government building, however magnificent, but the sweep of Broadway. The myriad offices needed to house 1,000 employees were grouped along corridors leading off from the central rotunda. To the left of the entrance was the cashier’s office, where ships’ officers and importers paid the tariffs that had been set by officials in other parts of the building. To the right was the wood-paneled Collector’s Office, where the Collector of Customs conducted official business. Gilbert’s attention to detail was legendary; he was involved in the design down to the smallest decoration. He also relied on numerous extraordinary collaborators. Exterior statues of figures personifying America, Asia, Europe, and Africa are by Daniel Chester French. The ceiling of the central rotunda was designed by famed master craftsman Rafael Guastavino, whose other credits in New York include the Oyster Bar at Grand Central Terminal, Grant’s Tomb, and Carnegie Hall. Guastavino was also involved in the construction of the Custom House’s stairs. Much of the paneling in the Collectors Room was done by Louis Comfort Tiffany’s woodworking studio, which he had not yet sold to focus on glass. Gilbert designed the decoration with two central themes: the sea and the U.S. Government. Marine animals and American eagles therefore dominate the ceiling decorations. In 1937, Reginald Marsh carried out a WPA commission to decorate the central rotunda with scenes of New York Harbor, adding to the nautical theme. As the Port of New York declined after World War II, so did the importance of the Custom House. 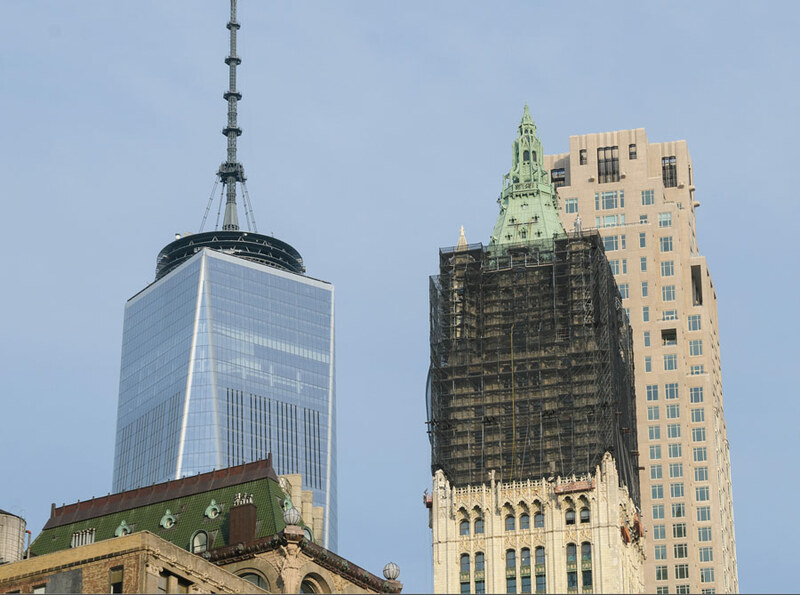 The post of Collector was abolished in 1966, and in 1971 the Custom House, much reduced in size, moved its offices to 6 World Trade Center. The Hamilton Custom House was slated for demolition, but efforts led by Senator Daniel Patrick Moynihan saved it from the wrecking ball. In 1976, it was listed as a National Historic Landmark, but it remained unoccupied and deteriorated. In the early 1990s, renamed in Hamilton’s honor, it was restored and adapted to house the NMAI, which now occupies the building along with various other governmental agencies such as a divorce court and, once again, a small customs office. Our Archtober group couldn’t have been happier that this magnificent building escaped demolition and can be experienced in its full glory. Join us tomorrow at the New Lab in Brooklyn Navy Yard! This story is part of a monthlong series of guests posts by AIA New York that feature Archtober Building of the Day tours. See the full 2017 schedule here. 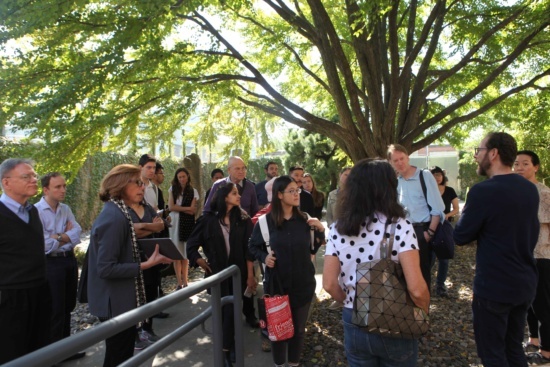 Today, Archtober got a tour of the Cary Leeds Tennis Center in the Bronx led by GLUCK+ principal Marc Gee. Gee elaborated the complex process of getting such a major public project built, and explained how the design/build capabilities of GLUCK+ allowed the project to be completed on time and under budget. The Tennis Center is a joint venture between New York Junior Tennis & Learning (NYJTL) and the New York City Department of Parks and Recreation. 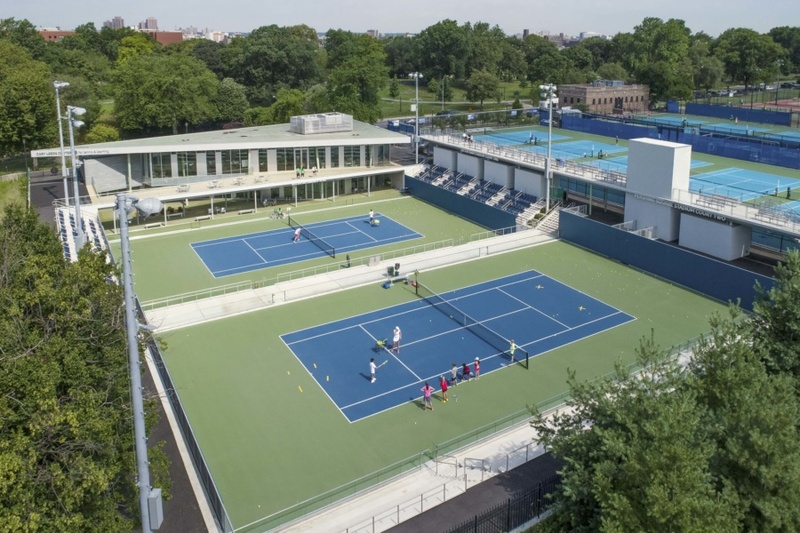 NYJTL, which runs tennis clinics and tutoring and academic programs, approached GLUCK+ with the idea for the Center, which would serve as a home base for all of NYJTL’s programs. The Center was to be named after Cary Leeds, a professional tennis player who tragically passed away, and whose parents wanted to commemorate him in a way that would help bring the sport he loved to more people. 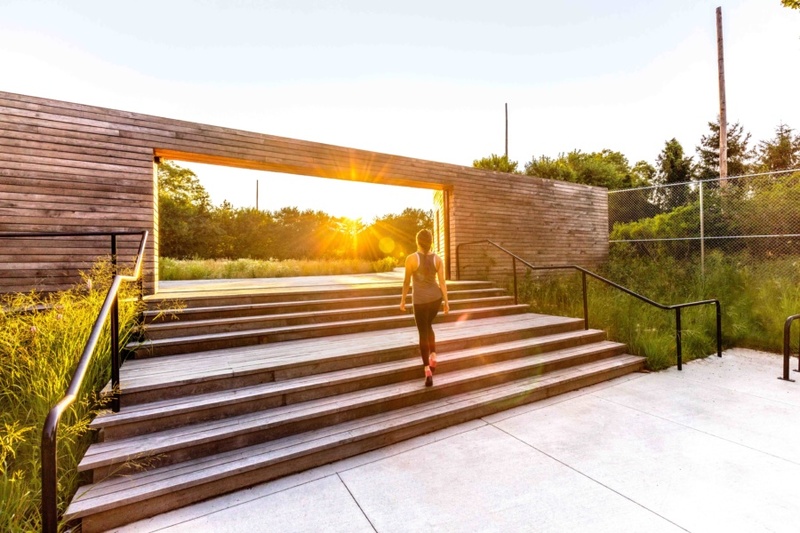 Over a number of years, GLUCK+ worked on five schemes for five different parks in three boroughs before finally being able to realize the design in Crotona Park. There are 12 new hard courts at the Center, ten of them bubbled for winter play. This number adds to the ten public courts that the Department of Parks and Recreation renovated. NYJTL uses revenue from renting court time during the winter to pay for its on- and off-court programming. In addition to the courts, GLUCK+ was responsible for the design of the airy clubhouse. The clubhouse had two design objectives: minimizing sightlines from the park and opening the interior space to the courts as much as possible. When the original design was rejected because at two stories it would have been visible from multiple points in the park, GLUCK+ decided to sink the lower floor below grade. From the park side of the tennis courts, all one sees is the fence of the tennis court – the Center itself is invisible. 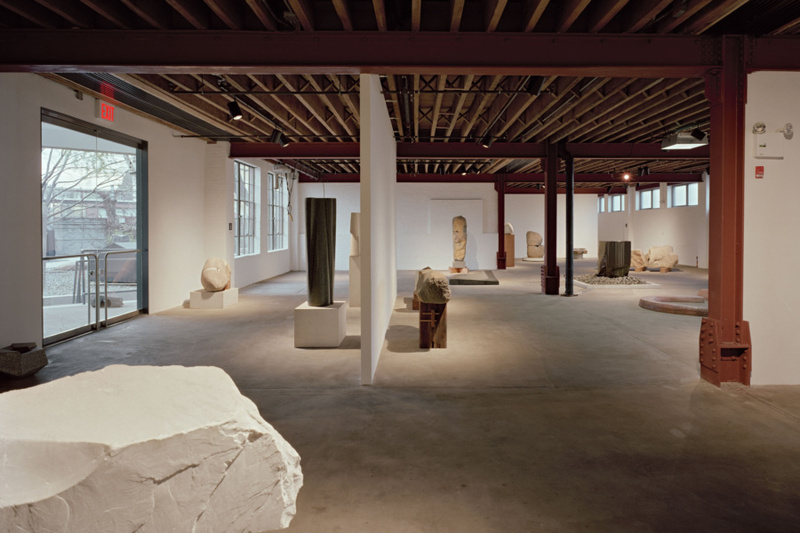 But once you enter the space from the front door on Crotona Avenue, it is clear that GLUCK+ have designed an extraordinary space. The top entrance-level floor houses a check-in desk, offices for NYJTL and, to the right, a restrained, adult-focused lounge. Locker rooms and a pro shop are located against the entrance wall, away from the courts. The far wall is all glass, opening to a terrace and giving a picture-perfect view of the two stadium courts below. In the middle of the room is the precast-concrete staircase, which, due to a manufacturing error, had to be recast and then moved in after windows had already been fitted, creating a logistical nightmare. At the bottom of the stairs is the kids’ lounge, accented by multicolored chairs and a tennis ball pit. Further on are a classroom and a broadcasting room – the Tennis Channel donated equipment so that children can interview the major players who stop by the Center. Other back-of-house functions like the kitchen are also downstairs. Glass doors lead outside, where a patio separates the building from the courts, providing, on the day we toured, space for a barbeque and other festivities. GLUCK+’s dual role as architect and contractor made the project possible, allowing decisions that would usually have taken weeks going back and forth from construction site to office to be answered immediately. When a construction issue forced the design to be adjusted, it could be done almost immediately. The project came in $1800 under the $26 million budget and exactly on time. And since, as Gee pointed out, “the only person with a deep stake in the design is the architect,” supervising construction allowed GLUCK+ to make sure that the design was executed just as they wanted. 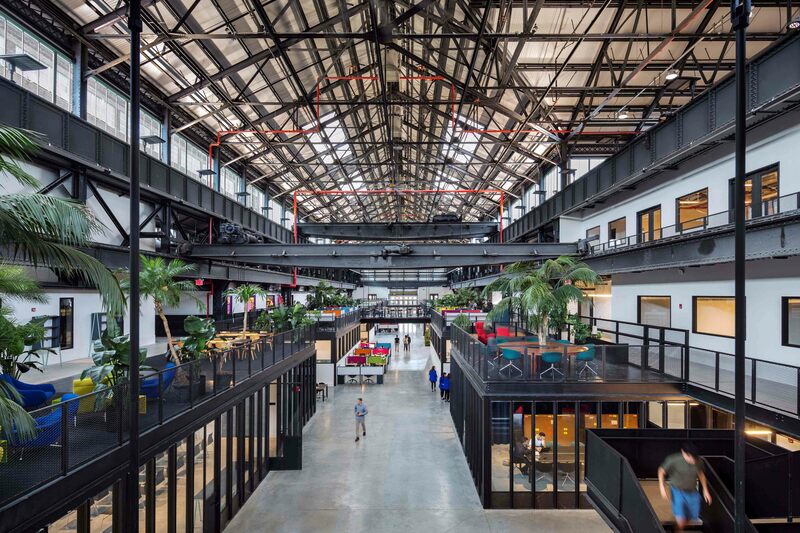 This story is part of a monthlong series of guests posts by AIA New York that feature Archtober Building of the Day tours. See the full 2017 schedule here. Archtober marks a wonderful time of the year when New Yorkers and visitors alike explore some of NYC’s “hidden gems” and “best kept secrets,” the conditions of which are more difficult to maintain with access to virtually anything at our fingertips. Perhaps one of late modernism’s finest residences occupies a narrow lot on West 58th Street. A white-painted, steel-and-glass facade designed by the late architect Paul Rudolph is an intricate composition that gives clues to an extraordinary interior. The ground floor houses the Modulightor showroom, a joint venture between Rudolph and the company’s founder, Ernst Wagner. Above are a series of duplexes, one of which is home to Mr. Wagner himself, as well as many of Rudolph’s possessions, including artwork, artifacts, books, and the architect’s grand piano. Ernst has vowed to keep the spirit of Rudolph and his incredible work alive by giving the public access to this unique home. The group of Archtober enthusiasts who joined us for a visit to the Modulightor Building had the opportunity to explore the duplex in a manner that one would not define as a tour. Instead, guests were invited into the Modulighter showroom and were directed to have a look around the third floor via a small elevator. With multiple levels, shelving, surfaces, and armatures that Ernst and Paul’s collections animate, one walks through a richly layered space that is both theatrical and functional. Rudolph masterfully transformed a traditional twenty-foot-wide row house lot into a light-filled, indeterminate space that is at once intimate and infinite. Rudolph loved off-the-shelf materials and he used white melamine, acrylic, sheetrock and his Wrightian imagination and rigor to create a mysterious and most pleasing home. 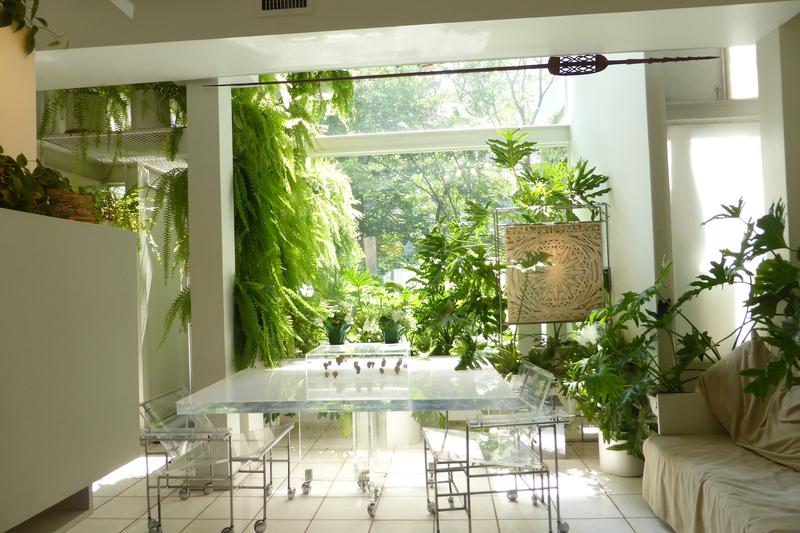 The interior winter garden flows visually into the outdoor patio and the lighting designed and manufactured in the building’s basement is almost invisible except for its ability to wash over walls and surfaces. On my one hundredth visit, I will still be discovering something new. It is difficult to piece together what one just experienced but you are sure to walk away wowed, pleased, and wanting to revisit it, like any great artwork. What is architecture without the people who inhabit it? After guests filtered through the duplex and patio, they gravitated toward where Ernst was sitting. You can still detect his strong Austrian accent as he shared many stories about living in the house, the painstaking attention to detail that Paul put into every detail, and the plans to finish the upper duplex in time to celebrate Paul’s 100th birthday, complete with an exhibition of the architect’s work. Be sure to visit this hidden gem and meet its jovial and proud owner. Your visit will support the Paul Rudolph Heritage Foundation’s mission to bring awareness to Paul’s vision and secure this Building of the Day as an important architectural and cultural landmark. 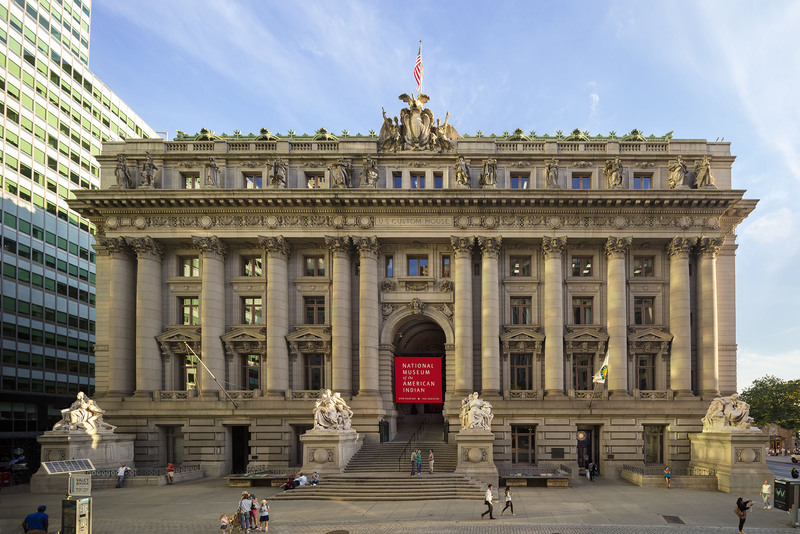 This is the first in a monthlong series of guests posts by AIA New York that feature Archtober Building of the Day tours. See the full 2017 schedule here. Archtober kicked off Sunday with an intimate tour of The Woolworth Tower Residences led by Joanna Stephens, Project Manager for CNY Group, and CNY Group President Kenneth Colao. Stephens and Colao described how the project, which converts the top 30 floors of Cass Gilbert’s historic Woolworth Building into luxury condominiums, has involved not only gut renovation of the relevant floors but also extensive structural reinforcement and MEP (mechanical, electrical, and plumbing) replacement. The Office of Thierry W. Despont is doing the interior design for the project, while SLCE Architects serves as architect of record. The owner-developer is Alchemy Properties. The tour started on the ground floor, where the residences will receive a separate lobby from the commercial space that occupies the first 28 floors. Stephens and Colao outlined the Woolworth Building’s history, beginning with five-and-dime store magnate Frank Woolworth’s desire to build the world’s tallest building. Construction took only two years, from 1910 to 1912, and the building opened in 1913. It remained the tallest building in the world until 1930. The current renovation completes the work begun years ago on the building’s top floors, and creates some of Manhattan’s most desirable residences. After our introduction, Stephens and Colao took us downstairs to the basement. The mechanical heart of the building, the basement, will now house a gym and wine cellar for residents. A feature of this gym is the original pool, soon to be restored to its former glory. Frank Woolworth put the pool in for the use of his executives. It was later bought by a private health club, but the NYC Department of Health closed it many years ago. The pool was also used as a mechanical area for wiring; whenever a new mechanical element was introduced, the old one was simply left in place next to it, so the pool eventually housed dozens of cubic feet of pipes and wires, some live, some not. One of the challenges of the renovation was to figure out which ones were redundant without turning off the light or water in the commercial floors, which remained occupied during construction. Stephens and Colao also discussed other challenges of gut renovating a landmarked building without disrupting the remaining tenants. One problem was the impossibility of putting up an exterior hoist. Instead, CNY temporarily requisitioned two elevators to function as tiny hoists, but the difficulty in bringing materials up such a small space slowed the construction schedule. Additionally, due to other regulations, no crane could be set up on the roof, so builders had to take apart some elements upon delivery, such as a generator, and reassemble them once they reached the correct floor. Once a freight elevator had carried our tour group to the residential levels, the true scale of the renovation became clear. We saw numerous residential floors at various levels of completion. Each floor is slightly different, based on the diminishing floorplates of the tapering tower and on individual buyers’ wishes. The two apartments on the 30th floor will be the second-most expensive after the penthouse, due to their extensive terraces. Most other floors will house two units, but some buyers have bought both apartments to create full-floor residences. We got to explore the model unit on the 38th floor, which displays the extent of Thierry Despont’s vision for the tower’s residents, complete with all modern conveniences in a sleek ensemble. 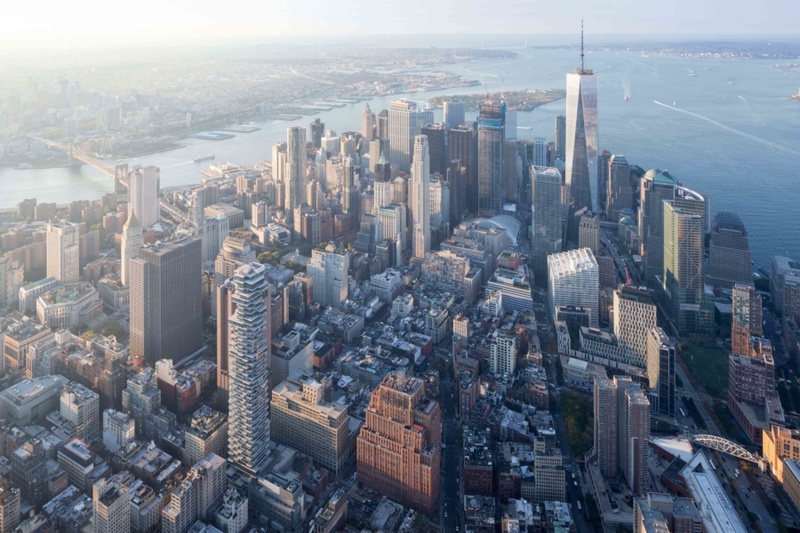 Finally, the penthouse, advertised as a “townhome in the sky,” will span the top five stories, connected both by a spiral staircase and by a private elevator. This opulent residence, still under heavy construction, will hit the market at $110 million. While much of this apartment is still scaffolded, the notion of living at the top of the Woolworth Building, looking out at the city over Cass Gilbert’s gargoyles, is extraordinary. 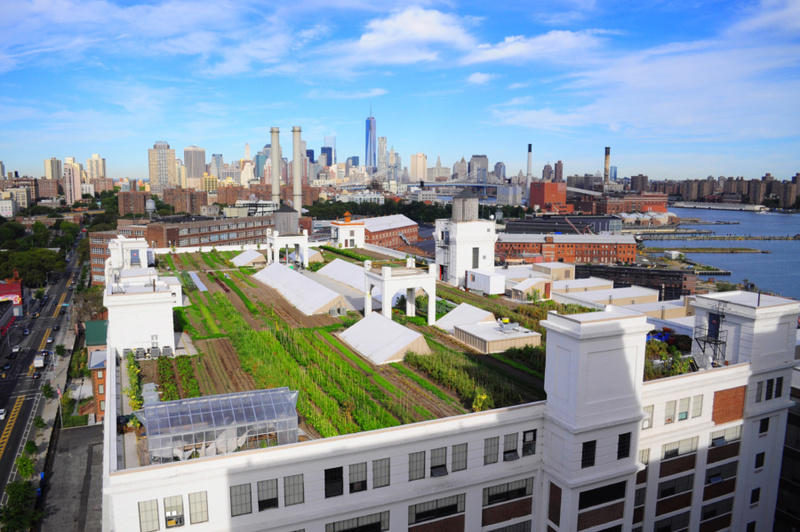 Tomorrow, join Archtober for another extraordinary view of the skyline when we tour the rooftop Brooklyn Grange Farm!